Apocalypse Zombie Commando, a universal iPhone app available for iOS including iPad, iPod touch and iPhone, is a delightful shooter that has an old school arcade feel without losing all of the innovation and refinement that has happened in the gaming world over the past twenty years. 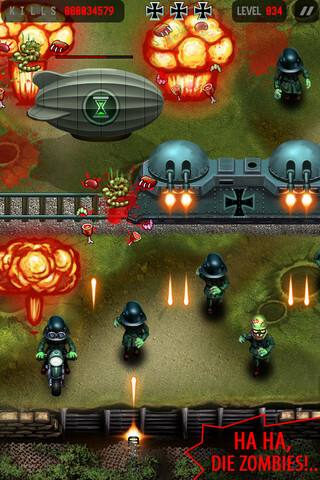 It combines the current popularity of zombies with the long standing gaming tradition of taking on, and beating, Nazis. The zombies in the game are not called Nazis, but between their uniforms and the symbols on the zeppelins it is clear that this is what we’re supposed to think of them as. Combing these two different symbols of evil is not a new idea but it works especially well in Apocalypse Zombie Commando. Each level gets progressively harder as a wider array of zombies and other assorted enemies, such as the aforementioned zeppelins, comes your way. Not only do their numbers increase, but their speed does, too. Those with experience playing these type of apps, however, will not have any issues getting through at least the beginning stages. One of the easiest things about Apocalypse Zombie Commando is that it only requires one button to play it. The graphics are well rendered and are among the best I’ve seen in an iPhone app. The sound quality is also quite good; however, it does have a tendency to get repetitious at times. Utilizing different sound effects and music for different levels would have been a nice change of pace, but as it is I found myself simply turning the sound down after a while and doing this didn’t have a negative impact on the experience. As with many other iPhone apps, Apocalypse Zombie Commando is instantly addictive and therefore is a fun way to spend idle time. It doesn’t require a lot of thought, which makes it a new favorite for activities such as waiting in a long line at a store. For this and the zombie aspect alone, it is easily worth the .99 that Apple is charging for it. A review would not be complete, however, if it didn’t mention that this does seem to be the type of app that one will eventually grow quite tired of and that’s mostly due to the limited gaming environment. Shooting bad guys, even when they’re Nazi zombies, can only maintain a high level of entertainment for so long in any format, so the fact that you never see your character and you’re forever stuck at the bottom of the screen is a negative point. By the time the boredom does sink in, however, it’s a virtual certainty that Apocalypse Zombie Commando will have more than justified its download cost. 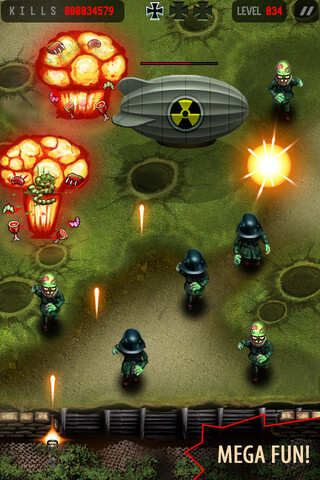 AppSafari review of Apocalypse Zombie Commando was written by Darius Reimm on November 30th, 2011 and categorized under Action, App Store, Arcade, Games, Scrolling Shooter. Page viewed 4031 times, 4 so far today. Need help on using these apps? Please read the Help Page.